​It is important to know that Reface isn’t going to be the right fit for every situation. In fact, Reface is a good fit, on average, only 1/3 of the time. This section outlines Cabinetry type, Inspection, Qualification, Delamination, Water Damage, Adhesion Surface Quality and Flat Joint Lines. Have flat sides, tops, & bottoms. The fronts are thin. Usually 3/4 of an inch thick. The doors will always cover the front of the cabinet. There is no center divider between doors. Hinges will mount on the inside wall of the cabinet. Usually have recessed tops and bottoms. The fronts are thicker. The size may vary by manufacturer but standard size frame is 2 inches wide. The doors can either cover the frame completely or the frame can show. There are 2 types of cabinets: Face Frame (Traditional/American) and Frameless (Euro). It is important to know which one you are working with as the cabinet style will determine everything from hinge style to the amount of Laminate you will need to order. ​Once you have identified the type of cabinet you want to reface, you will be able to calculate the amount of laminate you need as well as the type of hinge, and even the size tolerance of the doors. Euro cabinets will almost always need laminating on the bottoms of the upper cabinets. The tops of the cabinets, though flat, do not usually get laminated as they are never seen. Be sure to order enough laminate to cover the bottoms which will be covered in depth in Section 2 of this Installation Guide. Face Frame cabinets, unless they are completely flat on the bottom, do not get laminated on the top or bottom. You will have to pad out the sides with 1/8—1/4 inch plywood before refacing. ​It isn’t important what shape the old doors are in because they will be replaced. However, the cabinet boxes must be in good sound condition. It is important to remember that with refacing, the adhesion is only as strong as the surface it is being applied to. You will need to look for loose laminate or veneer, especially around the corners and edges. If you find issues upon inspection make sure it is possible to properly re-attach these loose pieces before you take on the reface project. Super glue, or gorilla glue will become your best friend in terms of overcoming delamination issues. Be sure to keep some in your tool bag at all times. ​ANY evidence of water damage is an automatic sign that refacing is not the correct fix for the job. Due to the potential health hazards concerning mold you should never reface any cabinet that shows signs of water damage. If you find swelling, blistering, flaking, dampness, or mold itself it is best to have the damaged product removed as soon as possible. Mold poses a very serious health risk to those who live in an environment where it is growing. Refacing can be done once the damaged boxes have been replaced. You will want to check the existing surfaces for imperfections that will possibly telegraph through when refacing. It can’t be stressed enough that your reface adhesion is only as good as the surface you are adhering to. When inspecting your cabinets you want to look for things like flaking paint, loose laminate or paper coverings (typically used on the sides of cheaper cabinets). If you see something questionable be sure to have a plan for fixing the issue before starting the reface. Some things like rough paint can be fixed with a little sanding using a hand or orbital sander. Other things like dirt and grease can be cleaned off with soap and water, or even a degreaser if necessary. ​For reface to be a good option the “Bones” of the cabinets need to be in great shape structurally. You do not want to reface cabinets that are sagging on the top or bottom, or cabinets that are bowed on the sides. Reface is only cosmetic so if you are in doubt as to whether a cabinet is good enough structurally to reface you should probably error on the side of caution and replace. 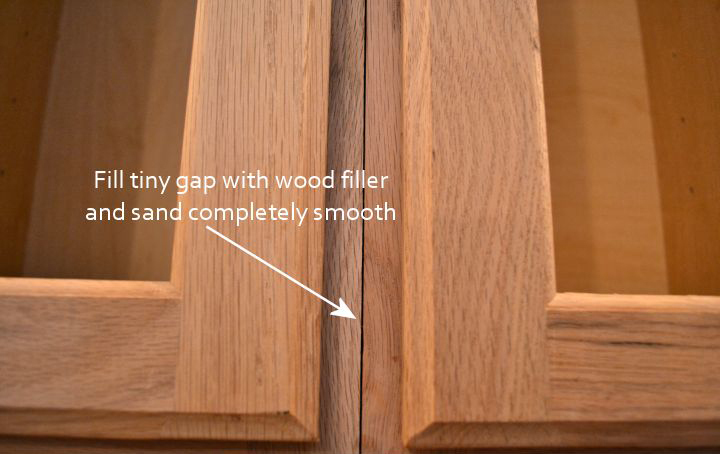 ​One of the last things you should look for in cabinet reface quality isn’t necessarily a deal breaker but it can mean a big difference in the time it takes to prep a job. When full facing a run of cabinets, (using one continuous sheet to cover multiple cabinets with one piece of laminate) the fronts of multiple cabinets should line up to create a transition that feels smooth to the touch when running your fingers across the joint of any two cabinets. If a gap exists it will need to be filled with wood putty, or Bondo, then sanded smooth before applying the laminate. ​The same goes for cabinets that have edges that stick out proud of the adjoining face. These joints will need to be sanded, or re-aligned if possible, before applying laminate so as not to end up with an air gap that will show through the laminate. There is no real guide for what is un-acceptable in this scenario. Use your best judgment to determine if the reward is worth the extra effort in prep work.